While I use my fair share of paid SEO software, you may be surprised by just how much good stuff is out there that’s completely free. That’s right. Zero cost, but big value. And we all like a bit of that, right? In this post, I share my top 3 favourite free SEO tools. These are super handy tools that anyone can use. For nothing. It may sound surprising, but Google itself is actually one of my favourite free SEO tools. In particular, it has two main functions that comprise two of my favourite tools. The first is Google’s “site” search. I often encounter prospective clients who complain to me that they can’t find their website anywhere on Google. Usually, this is due to the fact that their website’s content isn’t keyword optimised, they have very few pages on their website, they never update their website content, they have no written website content, or a combination of some or all of these factors. But sometimes, the problem is much simpler – and much more problematic: Google can’t actually crawl their website. In order to index the websites of the world, Google sends out little cyber robots to “crawl” the vast amount of data in the web-osphere. Naturally, there needs to be an opt-out for websites or web pages that don’t want to be crawled. (For example, if you’re a cloud invoicing company, you don’t want all your individual login pages to be crawlable.) These opt-outs are coded instructions to Google saying “stay away”. This is all very well and dandy… until you code the wrong pages to be uncrawlable. To conduct a site search, simply type “site:” immediately followed by the URL of the website in question. So if your website was crawlmenot.com, you’d search “site:crawlmenot.com”. See any results? Then Google can crawl and has crawled your website. Now it’s time to address your content and other issues to start coming up in the search results. Don’t see any results? Google hasn’t crawled and/or possibly cannot crawl your website. Now it’s time to speak to your web designer to check your robots.txt and other coding bits and bobs. Need a link? Here’s the Australian Google. I love using Google autosuggest as an SEO tool. When I’m doing a spot of keyword research for a new client’s website, I only have so much information about which terms people might be using to search for my client’s products or services. I have my client’s guesses, submitted in their copywriting questionnaire, and I have my own guesses, based on my knowledge of their business and industry. While we might both be right, we might also both be very wrong. Unless you live under a rock, or you’ve fiddled with your search settings, you’ll be familiar with Google autosuggest. It’s those suggested search terms that pop up when you begin typing in a search query. Google’s suggested search terms can be a gold mine for keyword research. They show you the sorts of terms, ideas, related terms, and words that real life people are actually searching for. And you want to be using terms that real life people are actually searching for. Naturally, there are a lot more steps in the keyword research process. But Google and its autosuggest function are often one of my first ports of call. You’ll find the Australian Google (my usual playground) here. Moz’s Title Tag Preview Tool would have to be my number 1 favourite free SEO tool. The title tag preview is designed to show you how a proposed title tag would look in the search engine results pages. This is handy, because although SEOs will quote maximum character lengths to you regarding title tag length (usually 55-60 characters), the reality is that title tag length is determined by pixels, not characters. After all, a title tag with several capital “W”s will take up a lot more space than a title tag with several of these wonderful characters: “|”. Title tags that are too long are abbreviated with an ellipsis (those three dots that look like this: …). This is bad because it means someone searching isn’t getting your full message. Some SEOs also suspect that having title tags that are too long can negatively affect your search rankings. Personally, I think the important thing is the negative user effect (it looks bad and they’re missing some of your message) rather than any theoretical negative SEO effect. So when you’re writing title tags, use Moz’s Title Tag Preview Tool to make sure they’re gonna fit for the sake of all those humans who are looking for you. 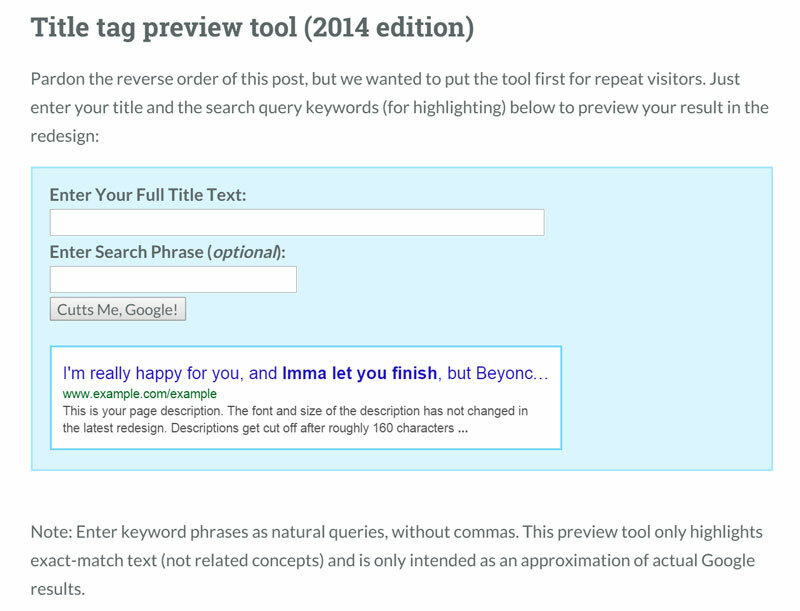 You’ll find Moz’s Title Tag Preview Tool here. Hopefully you’ll be excited to use these free SEO tools to help you with your search engine optimisation and copywriting. Everyone loves a freebie, right? They also say that sharing’s caring. So, if you know of another great FREE SEO tool, please share about it in the comments. You can also share this post on Facebook, LinkedIn etc to share the free SEO love. Go on – you know you want to!